It's DC Fashion Week! To celebrate, Louis at 14, an upcoming stylish and luxury apartment building located at 14th & U Street in DC, invited me to join their Fashion Facebook Contest where they challenged each participant to put together a complete outfit using only the Louis at 14 colors: white, black, pink, purple, and green. Here's the Louis at 14 look I put together. Green Leather Skirt: Nanette Lapore. White Button-up Blouse: Banana Republic. 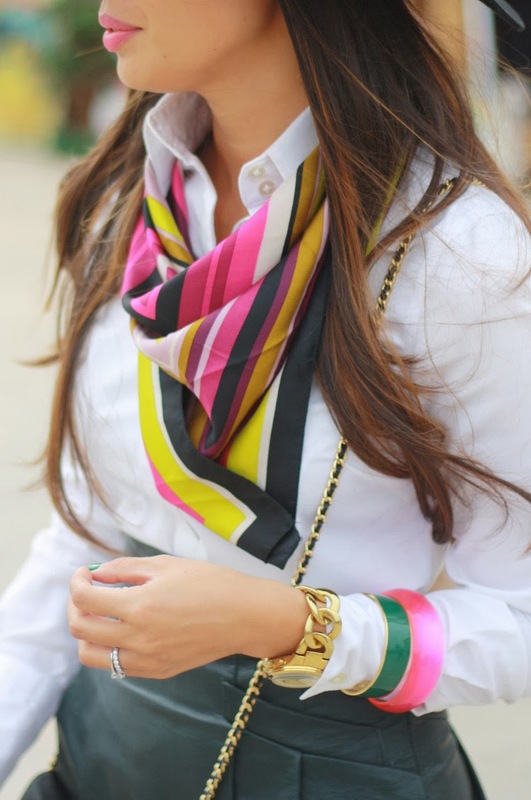 Green, Pink, Purple, Black, & White Scarf: Missoni for Target, old. Black Wool Hat: H&M. Black Wallet on Chain Strap: Chanel. Green Bracelet: J.Crew. Pink Shoes: Valentino via Nordstrom Rack (also here). Green Nails: Butter London. Pink Lips: Giorgio Armani. Moissanite Earrings: Charles & Covard, c/o. Watch: Michael Kors. Rings: She's Unique & Giant Lion. The Louis at 14 Fashion Facebook Contest will run for two weeks - Monday, September 23 – Monday, October 7, 2013. The person who gets the most votes wins a $350 Four Seasons gift card. Please go the Louis at 14th Facebook page, like their page, and VOTE FOR ME by simply liking my picture! The shoot was coordinated by the Design Army team and photography for the contest was shot by Sebastian Marin. Trying to become one with the greenery as Sebastian Marin takes a picture of my shoes. I brought along my silly pink star glasses for fun. Remember them from here? 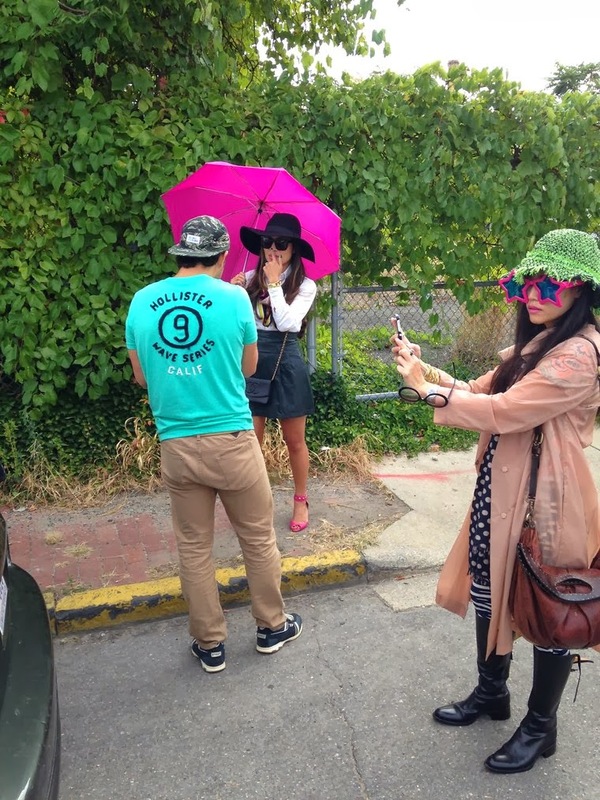 Michael Chan & Pum Lefebure from Design Army help style the shoot. I love this picture of Pum taking a selfie in my pink star glasses. She's hilarious! Don't forget to vote! Thank you! I saw the entries on the Louis at 14th Facebook Page. Such a fun and vibrant contest! What with purple, green, white and black being used (don't care much for pink...shhhh!). Anywho, you look fantastic! Love the star glasses, too. these pictures are stunning! i love the first one. Thank you so much!! Would LOVE your vote on Facebook!